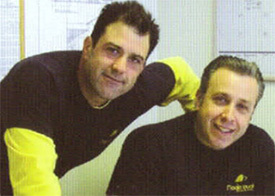 Magic Touch Contracting is a family business, owned and operated by lifelong friends John Costanza and Michael DelColle. John and Mike met in the fourth grade at Accompsett Elementary School and are both graduates of Smithtown High School West. Magic Touch was founded in 1984 as a general contracting company. At present, they are one of Long Island’s premier kitchen and bath remodeling contractors, conveniently located in East Setauket. A private showroom offers a wide variety of quality cabinetry and provides a truly unique and personalized experience. Over the past 30 years, Magic Touch has assembled a dedicated and talented team of professionals to provide end-to-end home improvement services. From architecture and design, to final finishing touches. We combine design, craftsmanship and dedication to deliver outstanding results for your home. All home improvement projects are handled from start to finish, from design to final walk-through and everything in between. At Magic Touch, customer satisfaction is the number one priority. Magic Touch is the proud recipient of the Best of Houzz Award for 2015 & 2016 for excellent customer satisfaction and reviews.